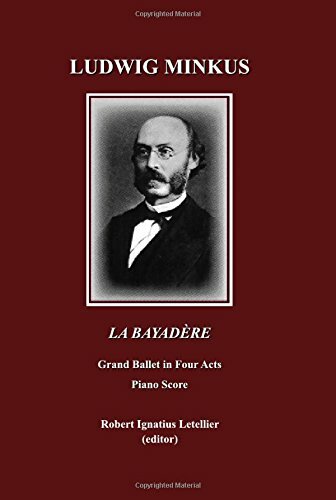 'La Bayader' was first produced at the Maryinsky Theatre, St Petersburg, on 4 February 1877. The scenario was by Sergei Khudekov and Marius Petipa, who also devised the choreography. The music was by the Austrian composer Ludwig Minkus (1827-1917), who spend most of his life working for the Imperial Ballet in St Petersburg. His music for this ballet - long scorned, never published, and endlessly re-arranged - has slowly emerged, since its revival began in the West in the 1960s, as a viable and significant musical achievement in its own right. Apart from the strongly defined melodies, infectious rhythm, and affecting harmonies, there is a powerful unity of conception and a sustained attention to mood that establishes its own unique incidental atmosphere. In its evocation of far-off times, the score conjures up an exotic Indian setting, where two spheres are set in contrast - a bright external world of colour and pomp, of ambition, rivalry and death; and an internal realm of night and dreams, of ideals, transcendent love and life - all realized most completely in the famous Kingdom of the Shades in act 3. The generous self-offering love of the temple dancer Nikia is one of the great stories of the Romantic ballet. Here for the first time is the piano score of the entire ballet. The music derives from four sources: a clear manuscript from the days of the Soviet Union; a version of Act 4 as held in the Library of Covent Garden; a beautiful Russian copy of the Kingdom of the Shades; and a potpourri from the 1880s by Johann Resch - the only music ever published from the score. Robert Ignatius Letellier was born in Natal, and educated in Grahamstown, Cambridge, Salzburg, Rome and Jerusalem. He is a member of Trinity College (Cambridge), the Salzburg Centre for Research in the Early English Novel (University of Salzburg), the Maryvale Institute (Birmingham), and the Institute for Continuing Education at Madingley Hall (Cambridge). His publications include books and articles on the late-seventeenth-, eighteenth- and early nineteenth-century novel (particularly the Gothic Novel and Sir Walter Scott), Biblical literature, and European culture - with emphasis on the Romantic opera and ballet. He has specialized in the work of Giacomo Meyerbeer (a four-volume English edition of his diaries, a collection of critical and biographical studies, a guide to research, and two readings of the operas, as well as compiling and introducing editions of the complete libretti and non-operatic texts). He has also written on the ballets of Ludwig Minkus.